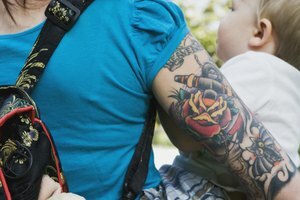 Half-sleeves typically refer to a tattoo that covers half the arm, whether that be from shoulder to elbow or elbow to wrist. After you've decided on your style and an artist that you love, you can pre-plan your whole half-sleeve tattoo or it can be designed by utilizing the pieces you've already got and connecting them together with more pieces or a background. Decide on the placement for your half-sleeve. If you go with your upper arm you'll have more space to work with and it'll be easier to cover if need be. You'll also choose between your right arm or left. Since the arm of a person's dominant hand is generally larger than the non-dominant one, some people choose to go with the larger space. On the flip side, some put their half-sleeve on the smaller arm because it can help that arm appear bigger. Determine a theme. Like full-sleeve tattoos that cover the entire arm from shoulder to wrist, a half-sleeve will flow well if a common theme is used throughout the design. So find your inspiration by researching themes you find interesting and adding in your own unique style to make the piece more original and special. If you have existing pieces, you'll need to find tattoos that flow with the existing ones or consider covering up any that don't fit your theme. If you're placing the half-sleeve on a spot that's already filled up, then you simply need to choose a background to connect the individual pieces into one flowing tattoo. Discuss your ideas with a tattoo artist. He or she can help you determine the best way to design your half-sleeve based on the theme and individual pieces you've chosen. 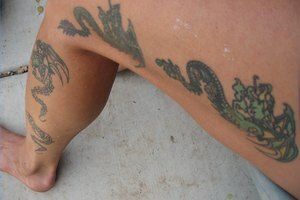 Your artist can also trace the area to be tattooed and design the entire piece beforehand. If you're dealing with pre-existing tattoos that need to be covered up your tattoo artist may want to cover those first before adding anything new to the area. Prepare for more than one appointment to complete your half-sleeve. The number of sessions depends on many factors including the intricacy of your design, the amount of time the tattoo artist can work in one sitting, your pain tolerance and how much the area is swelling or taking ink. If the piece is being split into separate sessions, your artist may break it the tattoo into sections or do the entire outline first, then work on the shading and color at later sittings. For some, designing a half-sleeve tattoo may be as simple as choosing a large koi, dragon, fairy or other large creature and adding a background, while others will want several smaller designs tied together into one piece. If the area is already fairly tattooed, you may want to consider just finding a background to tie everything together. Some common backgrounds include flames, water, wind, swirls and smoke. You can find design ideas in magazines, on the Internet and by visiting tattoo shops to look through their flash or to ask a tattoo artist to custom draw your half-sleeve. Although custom work tends to cost more, it'll help guarantee your half-sleeve is original. If you're worried about your tattoo showing while wearing a short sleeved shirt, then you may want to consider a quarter-sleeve instead of a half-sleeve. Always make sure the tattoo studio is a clean, sterile environment and that the tattoo artist practices safe and sterile procedures throughout the tattooing process. Don't forget, tattoos are forever. When designing your half-sleeve, be sure the overall design not only flows well but also has special meaning to you or is something you know you'll never regret. 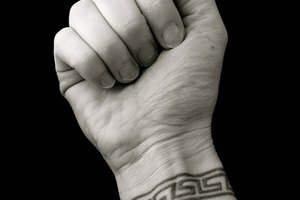 Good tattoos aren't cheap and cheap tattoos aren't good. Never solely base your choice of tattoo artists on price. This isn't to say you should always go with the most expensive quote, but make your decision based on the artist's previous work, their ability to do the type of work you want and their enthusiasm for the project.